Fall is here, and still Mother Nature has not decided to receive fall in her hands, it is 88 °F and beautiful sunny days with lot of clouds. Fall means lot of pumpkin, apple, cranberries, and I can find fresh cranberries in Walmart. I make some pumpkin dishes every fall, and this year I want to kick start my pumpkin baking adventure with this Sourdough pumpkin rye roll. It is made with my 3 year old sourdough starter. My sourdough is very forgiving for not treating her nicely, and yes occasionally I forget to feed her. Still she is not complaining and makes good bread every time. I have bought a can of pumpkin from Wal-Mart thinking of making pumpkin latte, however it turned out that I need some espresso shot to make it. So decide to use in making bread. Yes I made two kinds of bread with one can of pumpkin. You think I am crazy, yes little crazy of bread and pumpkin. 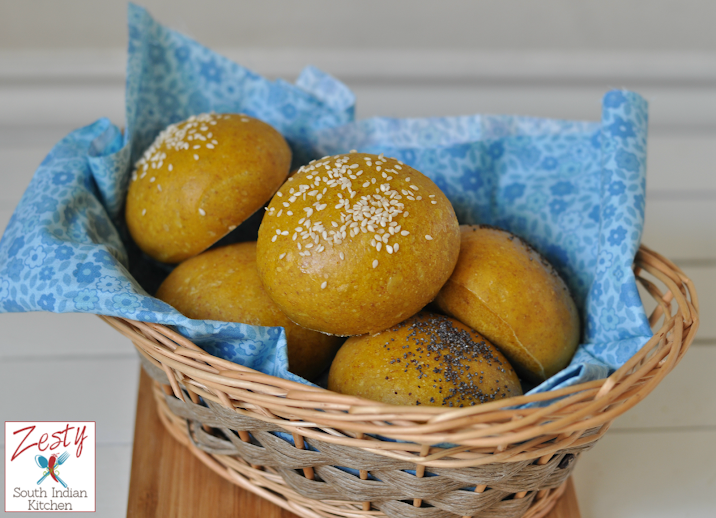 First I made a pumpkin whey whole-wheat bread then made this sourdough pumpkin rye rolls. This bread doesn’t have any added sugar that is good, second goodness is that even after adding eggs this bread is soft and delicious. Yes if you add eggs to bread it become stale so fast. Pumpkin gave the golden hinge to bread. Since I am trying this for the first time, I didn’t make very many changes to the original recipe, which occurs rarely. If you are fan of sourdough bread likes me, give it a try it is easy to make. The first day make rye leavin, then the next day make the dough. You need pumpkin puree, bread flour, egg, salt and oil. Mix everything to form a dough and bulk rise for 4 hours and then shape and do another rise for 4 hours. If you want less tangy bread reduce the rising time to 3 hours and add little commercial yeast. I enjoy eating sourdough so decide not to add any commercial yeast. In sourdough bread, important nutrients such as iron, zinc and magnesium, antioxidants, folic acid and other B vitamins are in easily digestible form. Also found that sourdough produces a lower surge in blood sugar than any other bread: a 2008 study , found that when people with impaired glucose tolerance were fed either sourdough or ordinary bread: the sourdough bread produced a significantly lower glucose and insulin response. Another important characteristic of sourdough bread is that gluten is broken down and rendered virtually harmless. It is also found that celiac patients fed with sourdough bread for 60 days had no clinical complaints, and their biopsies showed no changes in the intestinal lining. 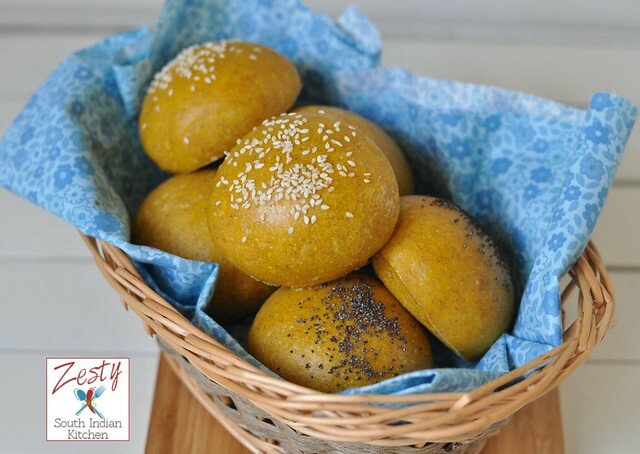 These dinner rolls makes excellent sandwiches, or even toast with little butter or apply a coat of Nutella; marriage between the sweet Nutella and tangy pumpkin dinner rolls is awesome. 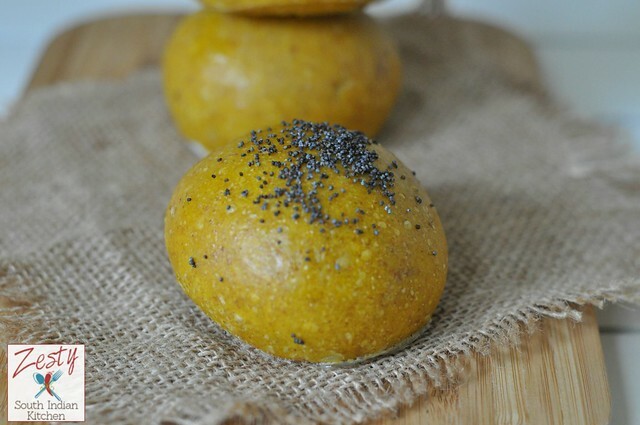 Delicious sourdough pumpkin rye rolls, goes well as sandwich or toast them with nutella. set aside for 12 hours for fermentation at room temperature. One the day of baking make a dough with all the leavin and ingredients listed for the dough. Rise at room temp for 4 hours or until it double in volume. Divide the dough (778g) into 9 portions(86.48), round, rest, shape them into smooth balls. Cover and set aside for rise at room temp for about 4 hours. End of the baking time, preheat the oven to 375F/190C. When you are ready to bake, brush them with egg wash and sprinkle sesame seeds and poppy seeds. Bake at 375F for 20min. Take out of the oven and brush with melted butter. Such perfect rolls .. well explained recipe. 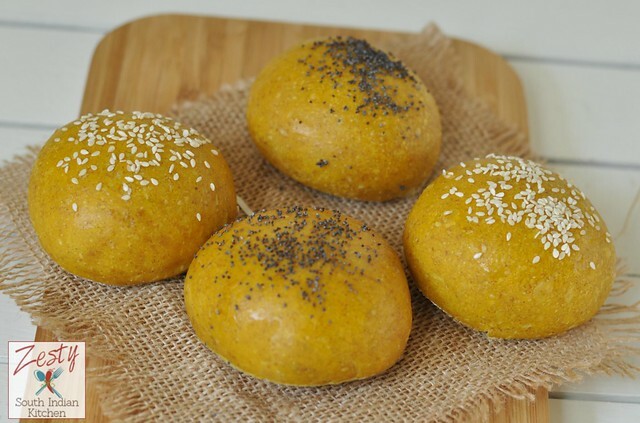 lovely pumpkin rye rolls. Love the beautiful colour. The bread looks so plump and fun to bite :). I think they’re perfect! Beautiful pumpkin rolls, I am definitely falling in love with them! Perfectly explained.. The rolls look perfect!